John McAllister Jr. [1786-1877], by unknown photographer, c. 1860. Unmounted albumen stereograph print, 3 by 5 ¾ inches. [John] was brought up to the hardware trade with Earp McMain Haven & West but never followed it. Was with Charles Belin and a Mr. Adams in the Butter & Cheese business but was not successful. He was for a time with the Crane Iron Co. and with energy might have been President. In 1848 he went with his Brother Thomas to Louisville Ky and was in some small business but unsuccessful. In 1853 I offered him and Thomas an interest in my business and we were partners til 1865. John A. McAllister [1822-1896], by unknown photographer, c. 1860. Albumen print, carte de visite, 4 by 2 ½ inches. Gift of John A. McAllister. Though William McAllister described a partnership with both his brothers, a formal business agreement in the Marian S. Carson Collection at the Library of Congress features only two principals, William and Thomas. As well, Philadelphia city directory entries for the firm of McAllister & Brother [always singular] during those dozen years have expanded listings of product specialties, and name Thomas and William as proprietors. John A. McAllister was listed in the city directories as an “optician” at the Chestnut Street store address for many years and was, at minimum, involved with the commercial photographs marketed there, but it is likely that his role in the shop was more that of a clerk. 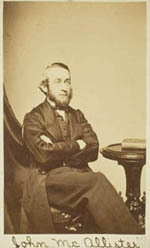 Several acknowledgement letters saved in his personal papers reveal that McAllister mailed photographs of churches and portraits of prominent religious figures to noted clergymen in the l850s and early 1860s, but the lack of request letters in the files suggests that those gifts were perhaps unsolicited, and may well have been his way of acquiring autographs for his collection. A few similar letters exist for the eyewear and portraits of prominent military figures he sent to servicemen during the Civil War, though in many cases those mailings were in response to their orders, which he also kept for his personal files. While John A. McAllister’s role in the family business remains unclear, his role in the family is more evident. Evidence supporting a fraternal rift first appears in 1875, the last time an occupation and the firm’s address are part of his entry in the city directories. A second suggestion can be found in the will that John McAllister Jr. prepared in March 1876, wherein he assigned bequests of both Philadelphia real estate, cash and securities to William, Agnes, and Frances, but only cash and securities to John and Thomas (who remained in New York through his death in 1898). When John McAllister Jr. died on December 17, 1877, Agnes inherited the family mansion on Merrick Street (now the west side of Penn Square at Market Street), and upon her death in 1879, she bequeathed the property to Elizette and Jessie Grant, the daughters of her sister Sarah who had died a decade earlier; the Grant family had lived in the house for more than twenty years having moved there after Sarah was widowed in 1852. The following year, the sisters sold the house to the Pennsylvania Railroad for $25,000 (approximately $500,000 today). It was immediately demolished to make way for the new Broad Street Station building, and within two years of the sale, both of the Grant women had also passed away. He had a comfortable estate from his Father but let it slip away. At the time of Elizette’s death [April 1882] he gave much trouble about her will –published articles in the paper about it. We have not been on speaking terms for years. He has broken up the family union and done no good to himself. By 1883, John A. McAllister moved away from central Philadelphia, where he had been born and lived for sixty years. He settled first in Germantown, nearly ten miles to the north. On January 7, 1884, in another act of alienation, he resigned from the Council of the Historical Society of Pennsylvania. The institution’s minutes reflected that “…except for 1 gentleman he was the only survivor of the council of 1860, but that of late his time and thoughts had been occupied with other matters than those of the Society.” After six years in Germantown, McAllister relocated to West Philadelphia and lived there until his death from nephritis at age 75. He died at his home, 4406 Sansom Street, on October 22, 1896. John A. McAllister had married Annette Steinbrenner (1832-1926) in 1861. Ten years his junior, she was born in New York to Frederick W. and Annette Steinbrenner, and had been living in Philadelphia with her grandparents Godfrey and Christianna Weber, her widowed mother, and five sisters. Weber (d. 1862) was a silk merchant and importer (a small group of his papers are part of the McAllister Collection, McA MSS 028). McAllister formed a closer relationship with the Steinbrenner and Weber families than with his own; his will specifically stated that he was to be interred “where my wife’s parents are buried” in the Weber and Steinbrenner family lot in Philadelphia’s Woodlands Cemetery rather than with his grandparents, parents, and siblings in the large McAllister ancestral lot within the same West Philadelphia burial ground. John A. and Annette McAllister had no children. The McAllisters were practicing Episcopalians, having left the church of their heritage, the Associate Presbyterian Church, in 1832 to worship with the Rev. 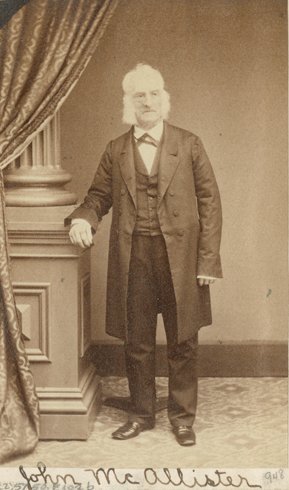 Stephen H. Tyng (1800-1885), first at St. Paul’s Church and later at the Church of the Epiphany. When Rev. Tyng transferred to a New York parish, his son Rev. 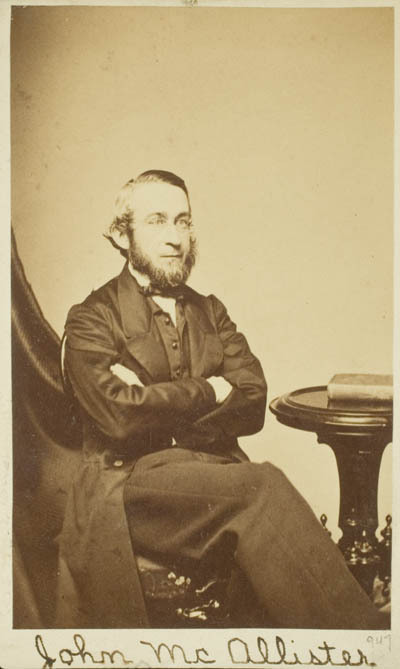 Dudley A. Tyng (1825-1858) became their pastor. The family’s religious migration was discussed by John A. McAllister in an 1855 letter to Benson Lossing (Lossing Papers, Historical Society of Pennsylvania). While his day job and much of his life remains a mystery, it is clear that a large part of John A. McAllister’s time and thoughts were occupied with accumulating the wide-ranging collection of manuscripts, ephemera, prints, broadsides, maps, photographs, books, newspapers, and pamphlets that he gave to the Library Company during the 1880s. The collecting impulse, if not some of the material itself, was inherited. When John McAllister Jr. retired from the optical shop in 1835, he began to assemble in earnest an antiquarian library described in Watson’s Annals (1905 edition) as “rich in works of all kinds.” Twenty-five years later, and nearing the end of his life, John McAllister Jr. created a detailed eighty-six-page manuscript catalogue of his holdings inscribed “Memorandum for my children,” a book, in his words, “suggesting a mode of Division for my personal effects” (the volume is in the Library Company’s collection, though not part of the McAllister Collection). With twenty-one separate classifications, there are sections including: “Books; Bibles; New Testaments; Coins and Medals; Family Portraits; Prints Paintings &c in Frames; Furniture and Plate; Prints, Photographs &c not Framed; Copperplates; Autographs in Books; Autographs – loose; etc.,” with a special category for the ancestral “Books which had belonged to J. Mc Senior.” He assigned each item in the catalog to one of his children or grandchildren. A memorial published at John McAllister Jr.’s death described his “collection of ancient pamphlets, newspapers, maps, and manuscripts being large and well-arranged” and his methodical inventory, begun in 1860 and updated through 1867, would seem to support that view. While the “Memorandum” specified the many items meant for John A. McAllister, it is unclear whether and when he was given anything prior to his father’s 1876 will, which specified that his collection was to be divided equally among his five living children, as directed by his executors William and Agnes. The actual disposition of the material is unrecorded but for one document written in John A. McAllister’s hand, and now in the McAllister Family Papers (Coll. 2139) at the Historical Society of Pennsylvania. Dated January 10, 1880, it is a receipt in which he acknowledged that his brother William had paid him “Two Thousand Dollars for my interest in the Books, papers, medals & coins & curiosities of the Estate of my Father J. McAllister jr.” Five years later, in a letter to the librarian of the Library Company of Philadelphia who was seeking some pamphlets once owned by John McAllister Jr., John A. McAllister suggests that he ask William for them, then added “don’t mention my name however?” (Smith Family Papers, Library Company). The John A. McAllister Collection held by the Library Company has many thousands of items encompassing some of the same classifications as his father’s collection, but few with a provenance to connect them to John McAllister Jr. and his famous library. Part of John A. McAllister’s acquisition efforts is documented in his papers, particularly in Series I, but it is primarily that of his Civil War-related material. His pencil annotations (generally name recognition notes) are on many of the pieces in the McAllister Collection, principally the manuscript letters. Without autobiographical writings—or even contemporary biographical memorials such as those earned by his father—it is not possible to know what drove McAllister to acquire, and to keep, what he did. It is not hard to imagine, though, that he would have aspired to be included among the great antiquarian collectors in Philadelphia during his time, joining men such as Ferdinand Dreer (1812-1902), Frank M. Etting (1833-1890), Simon Gratz (1840-1925), and Charles A. Poulson (1789-1866). His extant papers prove that he was in touch with important collectors on the national level such as Lyman Copeland Draper (1815-1891), Thomas Addis Emmet (1828-1919), John S.H. Fogg (1826-1892), Brantz Mayer (1809-1879), Benjamin P. Poore (1820-1887), and William Buell Sprague (1795-1876), and specifically for Civil War material, Benson J. Lossing (1813-1891) and John Russell Bartlett (1805-1886). Why John A. McAllister chose the Library Company as a final repository for his collection is also unknown as, unlike his two grandfathers, father, and two brothers, he was not a Library Company shareholder, and had had for more than thirty years a close relationship with the Historical Society of Pennsylvania, making donations of collection material there through the early 1880s and steering other donors their way (see, for instance, the letter from J. Elizabeth Jones in Series I). The minutes of the Library Company directors shed little light on the matter aside from a mention on April 4, 1886, that A communication was received from Mr. John A. McAllister offering to give the company a collection of illustrations and printed matter relating to the civil war, which he said had cost him the labor of twenty years and more than a thousand dollars of money. For additional information about McAllister, his Civil War material, and his circle of colleagues, see “John A. McAllister Collects the Civil War,” in The Magazine Antiques 170, no. 2 (August 2006), p. 102-107.